How do you trade your SOLBE1 Shares? Current SOLBE1 Share price as of " + time_value +'(15 minute delay) is: R' +share_value.toFixed(2)); jQuery('#field_7_21').prepend( "
*NB: These Shares are only tradable from June 2018 and subject to Share price fluctuations. Need to know how many bonus shares you may be awarded through your participation in Sasol Khanyisa? 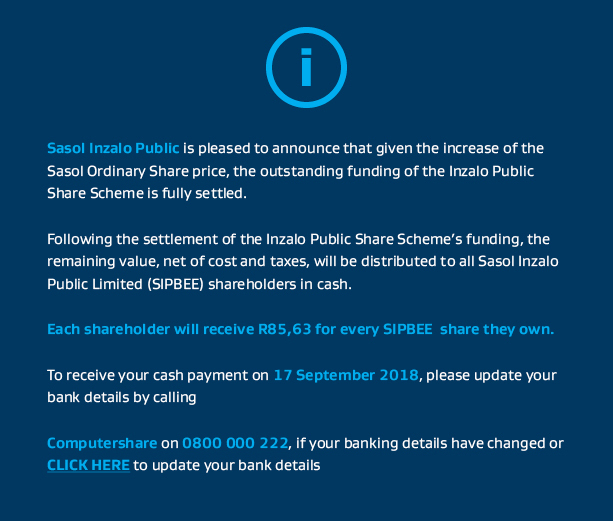 Our quick share reference calculator will estimate the number of bonus shares you can expect to receive, from Sasol Khanyisa. Please enter the number of shares that you currently have, please contact ComputerShare if you are unsure. If you elected to retain your SOLBE1 Shares you are eligible to be invited into Sasol Khanyisa from 16 April to 11 May 2018. NB: As these Shares are only tradable in 2028, no potential value can be calculated at this stage. NB: Please ensure you press the reset button, after using the tool. Disclaimer: Calculated figures on this site are only intended to provide an indication of the potential value of Shares calculated. The terms of the SOLBE1 Election Right Document and/or the Free Share Allocations letter will apply and will prevail in the case of a conflict or calculation error with this calculator. This calculator has been created to assist you in your participation decision making.